a typically gloomy Bank Holiday Monday. Like much of the Colas 37 fleet the locomotives have been purchased from preservation. The train was running from Derby to Hither Green ready for a weeks work on the Southern Region. will use their new and expanding fleet of class 37's to provide traction to the various trains in the fleet. 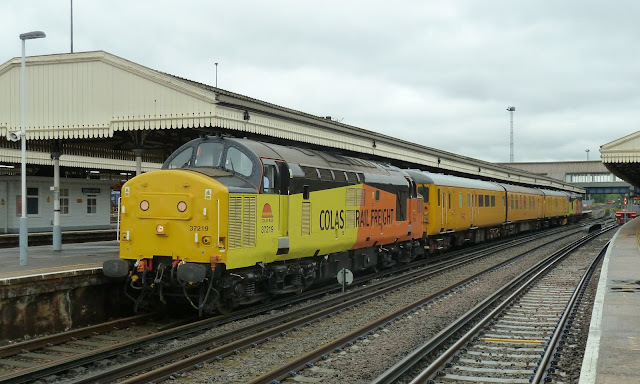 The new deal is likely to spell the end for class 67's on test train workings while the release into traffic of the class 73's being re-built by RVEL is also eagerly awaited to fill the gap left by the Network Rail class 31's which have now been withdrawn. It is expected that class 37's from DRS will continue to be hired in when they are required. Comment- Rail needs a union with Unions.